Comments: ALTERNATE EDITION: *THIS IS A TEACHERS EDITION TEXTBOOK! *** Book in "Acceptable" condition. Will show clear signs of use with water damage to pages and worn, bent or torn covers. 2nd day shipping offered. Ships same or next day!!! Used books may not contain supplements such as access codes or CD's. We have the best customer service online!.This is the U.S. student edition as pictured unless otherwise stated. 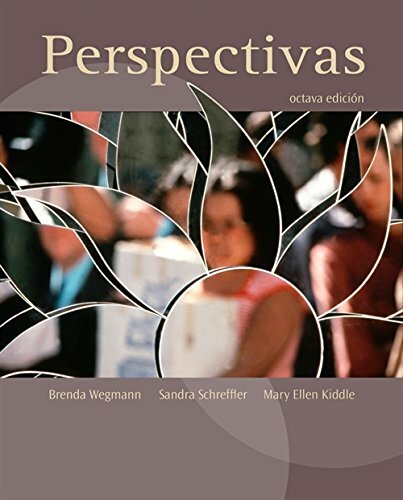 Intermediate and post-intermediate Spanish: reading and conversation.Sandra Schreffler is the author of 'Perspectivas (with Audio CD) (World Languages)', published 2009 under ISBN 9781413033373 and ISBN 1413033377. Loading marketplace prices 15 copies from $34.87 How does the rental process work?